Probably the first thing I made for my hope chest when I was a child was dish towels. 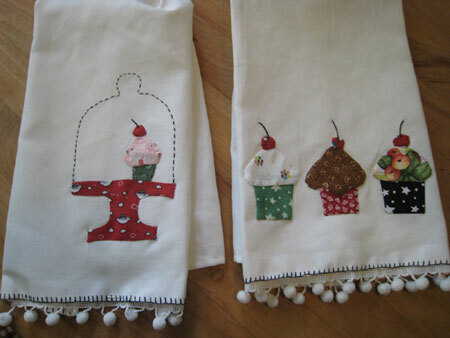 These cupcake dishtowels would be perfect for that! Includes sewing instructions, applique patterns, stitching pattern, embroidery instructions, & photos for guidance You will need to get 1 1/2 yards of white or cream colored fabric, something absorbent and good to make dish towels out of; one yard of white ball-fringe (balls should be about 7/8"); one skein of black embroidery thread, an embroidery needle, and some colorful bits of fabric for the cupcakes and plate.